Promo gift are an excellent way of targeting a specific product to a specific market as it helps customers get a broad understanding about the functionalities of different products your brand can do and how practical they can be in daily life. It is also a way of throwing your name outside your office (spreading the word out) of your brand in order people gain a brand awareness. In this case, we are going to talk about printing your business logo in colour changing stress balls and how it can help boost sales. Most of your potential customers will be active workers and everyone in this world have stressful days. Why not offer clients a way of relaxing and calming down? This is what stress balls do, making your day as joyful as possible and to forget about your problems for a while. Imagine how many people will receive this product once you give them away. For instance, an office worker might take this stress ball to her office and play with it to ease stress. Her co-workers may face the same situation and this ball is passed around. If you print your business logo on this promo gift many people will see it. 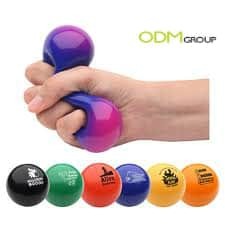 These stress balls also have a peculiar design as they change colours which is a way of relaxing people. This feature makes it a great promo gift idea. Once these kind of products are used, your customer will get an understanding of the practicality of your products and will come back to your retail shop to purchase more products as they will remember the brand name as they will see it every day. A simple exclusive small product can make a big difference to your profit margins at the end of the month as your clients will perceive the service you are giving them. We could also include these kind of products like a free giveaway as they don´t cost too much but they can make a massive impact to your sales.